Gavere, Belgium –Vincent Baestaens (Telenet-Fidea) took his biggest win of the season in the U23 Superprestige race in Asper-Gavere today. In another thrilling race he outsprinted European champion Lars van der Haar and Belgian champion Jim Aernouts for the win. German Marcel Meisen (fourth), Dutch Michiel van der Heijden (fifth), Joeri Adams, Wietse Bosmans, Gert-Jan Bosman, Sean de Bie and Kevin Eeckhout rounded off the top ten. As usual it was Tijmen Eising (Sunweb-Revor) who took the lead from the start, followed by Lars van der Haar, Jim Aernouts, Vincent Baestaens, Marcel Meisen, Joeri Adams and Wietse Bosmans. The American riders Jerome Townsend and Danny Summerhill didn’t have a luck day. Townsend crashed on the first lap but was able to finish the race. Summerhill also suffered a crash and had to abandon the race after the second lap. Early reports indicate that Summerhill did not re-injure his recently separated shoulder. From the third lap, van der Haar put the pressure on his competitors and reduced the leading group to just three riders. With five laps to go the trio of van der Haar, Aernouts and Baestaens had a 10 seconds lap on a chasing group with Marcel Meisen, Tijmen Eising, Arnaud Grand and Wietse Bosmans. Later in the same lap, Meisen, Eising and Bosmans bridged up to the front forming a new break of six riders. Lars van der Haar didn’t approve of the swelling ranks, and the little Dutchman accelerated once again. That effort immediately dropped Eising and Meisen, later followed by Bosmans. With three laps to go Meisen refound his best legs and was able to rejoin the break again as the three in front settled down for the final push to the finish. Van der Haar and Aernouts did most of the work as Baestaens gave the impressions he couldn’t contribute. In the final lap van der Haar kept the pressure on his rivals, again dropping Meisen off the break. 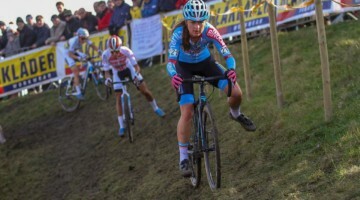 Van der Haar wasn’t able to get rid of Aernouts and Baestaens, and a sprint had to decide the winner of the 2010 edition of the Superprestige race in Asper-Gavere. Baestaens took the lead before the final corner and made it a long sprint. Van der Haar tried to come along, but ended up second, with Aernouts finishing in third. Jerome Townsend and Jeremy Ferguson completed the race anonymously in 34th and 35th. 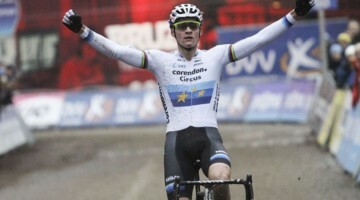 In the overall ranking for the Superprestige Jim Aernouts retains in the lead. Van der Haar and Adams are second and third, respectively. The youth races were won by Jens Vandekinderen (Juniors) and Mathieu van der Poel (Beginners).